FINALLY!!!! After a long and tedious search, EZHelp Computers found software we can endorse. 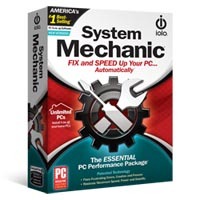 "System Mechanic" by IOLO Technologies provides the end user with all the tools necessary to boost your computer's performance. The best part? You don't need to be an expert! System Mechanic will perform EXACTLY as expected; repairing the registry, tunes your PC automatically and boosts Internet speed. If your computer seems to have slowed down over the years - we strongly recommend allowing "System Mechanic" to bring it back to life!